The Purple Coin was named Game of the Month in July 2012. The Purple Coin is a minigame developed by Miles that was originally made for Minigame Competition #23. In this game you play as a magical purple coin. It has special powers, the main one being the ability to take over the mind and body of any enemy. 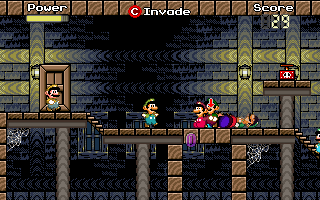 The aim of the game is to survive for as long as possible against a swarm of Evil Collector Bros. They get smarter and start to appear much faster over time. If the coin touches a Bro, it is collected and the game is over. Bros have an "eye for an eye" sense of justice, so if they see a Bro attack a Bro, they will attack the attacking Bro. This can lead to big brawls. Defeating Bros is done in a variety of ways. The easiest way is to possess one and make him attack other Bros. This will earn you points as well as fill up your two Power meters. The primary energy bar indicates the amount of magic energy you have left. This energy is needed to hide and possess Bros. The second one, once full, allows you to call in Batbro who then defeats all on-screen Bros. The Purple Coin was developed during the 23rd Minigame Competition, which was themed around coins. When it was first released it only had one stage and no music, but it met very positive responses either way possibly due in part to the fact that the concept was rather unique. With that he won first place as well as a Game of The Month award. When the competition was over he posted a slightly updated version on the MFGG main site which included music and a few bug fixes. He got quite a few responses saying that he should expand on the game, so he did. In August 23 of the same year he published on the main site a newer and bigger version of the game, which tried to address problems people had with the previous version. People were still complaining that it was too short, so he once again expanded upon it. A demo of the new upcoming version was released at NCFC 2012, and it won Best of Show. He released the final finished game on April 2 of the following year. This page was last edited on 29 June 2013, at 17:09.